The major associated factor which is linking dentistry and sports is the dental trauma during sports. It is one of the most recent and upcoming fields in dentistry. Sports dentistry is the prevention of oral/facial athletic injuries and related oral diseases and manifestations. It has two major components: first being the treatment of orofacial injuries and the second being the prevention of sports-related orofacial injuries. To provide comprehensive care, a dentist must be knowledgeable and adapt in the areas of oral surgery, endodontics, operative dentistry, orthodontics, hospital dentistry, and patient behavior management. It is common among the children involving any form of sports to get hurt, and face is the main area of damage. The facial bone damage escorts the fracture of the tooth and its associated structures. Prevention is certainly a hallmark of dentistry. The National Youth Sports Foundation for the Prevention of Athletic Injuries has reported that dental/orofacial injuries are the most common type sustained during participation in sports. The various orofacial injuries associated with contact sports include soft tissue lacerations, abrasions, contusions, tooth intrusion, tooth avulsion, crown and/ or root fracture, loss of one or several teeth. The less frequent trauma includes fractures of the zygoma, mandibular fractures, alveolar fractures, and traumatic injuries to the temporomandibular joint. Hence, pediatric dentistry focuses mainly on the prevention of these fractures by various appliances under sports dentistry. It is known that majority of dental injuries are witnessed in children ranging from 8 to 11 years of age which accounts for 19.2%–36% of all injuries. The risk of oral injuries during performing sports can be reduced markedly using mouthguards. It offers protection by untying the cheeks and lips from the teeth, making users less vulnerable to soft-tissue laceration, and preventing opposing arches from traumatic contact, and these protective devices provide a resilient, protective surface to distribute and dissipate transmitted forces on impact. Unfortunately, only a very few organized amateur sports require mouthguards during practice sessions and while playing. Amateur sports that mandate the use of mouthguards at the present time are boxing, football, ice hockey, lacrosse, and women's field hockey. In 1990, the National Collegiate Athletic Association advised football players to use bright-colored mouthguards instead of the more conventional clear variety. This rule was enacted so that coaches and referees could better determine whether players were actually wearing this required piece of athletic equipment. The most common preventive measure recommended for the youths and adolescent athletes to use is mouthguard. The benefits of wearing mouthguards during contact sports are of paramount importance. Protective devices help reduce the likelihood of oral trauma, concussions, cerebral hemorrhage, loss of consciousness, and also death due to a number of mechanisms. However, a high rate of dental trauma and minimal utilization of mouthguards has been reported in athletes, in spite of having adequate information about its usage. Awareness and practices of school teachers, sports officials, parents, and players toward protective devices influence the usage of these protective devices. Physical instructors are the main stakeholder in the proper use and promotion of sports dentistry. However, there is a paucity of information in the literature regarding awareness of physical instructors on orofacial protective devices. Hence, the aim of this study is to evaluate the awareness and attitude toward mouthguard and its use among physical trainers in Sullia. Participants for the study comprised 50 physical instructors from various schools in and around Sullia. To assess knowledge, attitude, and practices, a 16-item self-completion open-ended questionnaire was distributed to these coaches individually by an investigator (hand-to-hand) and was explained about the study in their understandable language [Appendix 1]. Furthermore, the questionnaire was prepared in the language which they were very much familiar with (English). Anonymity of the participants was maintained. Faculty of dentistry was excluded from the study because the coach of the sports team of the faculty of dentistry is a dentist. Appendix 1 represents the questions of the coaches' questionnaire which was developed from previous surveys. The questionnaire was designed to obtain information about the importance of mouthguards in the prevention of orofacial injuries, current use and type of mouthguards, disturbance associated with mouthguard use, and general attitudes toward mouthguards. They were also asked whether any of their athletes used mouthguards, whether they felt that mouthguards prevented oral injuries, whether they would like to have more information on mouthguards and the different types, whether they think that a mouthguard influences the athletes' performance, and what are the possible reasons for their athletes not wearing mouthguards during sports activities. Participants were given enough time to understand the questionnaire and to answer it, and then, the questionnaire was collected back by the investigator on the same day itself. All coaches participating in the study completed the questionnaire. Each athlete was asked a series of questions concerning the type of sports practiced, his/her awareness and use of a mouthguard, whether a mouthguard was owned, and any history of oral trauma while participating in sports. The participants' use of a mouthguard during games was also encouraged. Data obtained were analyzed and expressed as a percentage. Of 50 participants in the survey, 37 were males and 13 were females. The age distribution of the participants was in between 30 and 50 years. [Figure 1] presents the graphical representation of awareness about the device, whether it has any role in protecting the teeth, thus preventing oral injuries and its influence in athletic performance. Seventy percent of people were involved in contact sports. Among the 50 trainees, only 58% are aware of the mouthguard appliances, while the rest 42% were unaware. Among the 58% awarers, only 40% of people are using mouthguard. Among 60% of the people who are not using mouthguard, 34% of people said that they have never thought of using it, 36% people said that they are not finding a reason to use it, and 10% people have not had an injury before, so they do not find a reason for using this appliance, and 10% people believes that it is expensive. Fifty percent of people said they would not play without mouthguard and 40% were willing to play without mouthguard which demonstrates their mindfulness and deposition toward the appliance. Eighty-eight percent of people believe that mouthguard protects their teeth. Eighteen percent of individuals give bad experience while using mouthguard, in that, 30% issues were obstruction with the breathing, 10% said that it is uncomfortable, 10% issues were about the appliance is loose while using it, 18% said that it is hard to talk with it, and 2% of individuals voted in favor of the reason of costly. Indeed, even the mouthguard uses less among physical trainers, 88% of individuals believe that mouthguard anticipates oral injuries in the meantime and 36% of individuals think mouthguard influence athletic performance. Fundamental reason behind being less aware is because of awareness programs, 38% individuals are not getting any kind of training about sports injuries from their club. Moreover, 82% of the people demonstrate interest for getting more information about the appliance and its types. Till now, mouthguard wear has not been promoted actively among physical trainers. Injuries to the orofacial area often mean lifelong sequelae with considerable follow-up costs. According to different reports, sports-related facial fractures account for 4–18% of all sports injuries and 6–33% of all facial bone fractures. Different studies have shown that such injuries could be prevented by wearing a mouthguard. The prevalence of orofacial injuries varies depending on the type of sports played, the degree of contact, and the age, gender, and geographical location of the individual studied. Orofacial injuries have widespread and problematic implications. Such injuries may impact physical, psychological, social, and economic aspects of life. Physically, orofacial injuries can result in abnormal primary teeth exfoliation, failure in permanent teeth eruption, unfavorable color changes in teeth, development of painful abscesses, and tooth loss resulting in unaesthetic gaps in the mouth of the injured victim. In fact, an athlete is 60 times more likely to suffer harm to the teeth when not wearing a mouthguard. Mouthguards help buffer an impact or blow that otherwise could cause broken teeth, jaw injuries, or cuts to the lip, tongue, or face. Mouthguards also may reduce the rate and severity of concussions. Since the mouthguard is nontoxic with minimal moisture absorption, elastic property, and its ease of manufacture, its use is highly recommended during sports activities. The Academy for Sports Dentistry (ASD) “recommends the use of custom fabricated mouthguard made over a dental cast and delivered under the supervision of a dentist.” The ASD strongly supports and encourages a mandate for the use of a properly fitted mouthguard in all collision and contact sports. In the present study, the use of the mouthguard appliance among the physical trainees during training the athletes is less. Various reasons may be attributed to this. Lack of proper awareness among the physical trainers on the usage of mouthguards is seen developing countries such as India. In the present study, only 58% of the instructors were aware of the use of mouthguards. Among them, only 42% have used them before. Athletes and their instructors commonly have a misconception that the use of mouthguards will negatively influence the performance. 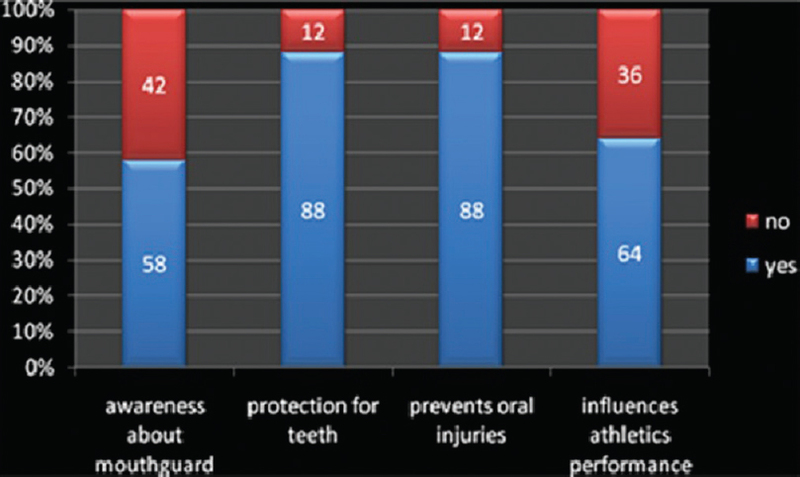 In the present study, 64% of the instructors felt that mouthguards negatively influences their athletic performance. Subjective factors such as difficulty in speech, looseness of the appliance, difficulty, or obstruction with breathing can also influence the acceptability of the appliance. Easy availability and cost of the appliance can also attribute to the acceptance of the appliance in a rural area of a developing nation. In developing countries such as India, not much importance is given for protection against orofacial injuries in the sports area which can be rectified by conducting various awareness programs. This is in accordance with the study conducted by Neeraja et al., who stated the reasons for not using mouthguards, which concluded 40% of the athletes refrained from using the appliance due to the lack of availability, whereas 27% due to the lack of proper fitting of the appliance, 10% due to the difficulty in swallowing, and 8% had difficulty in speech. As 82% of physical instructors demonstrated interest for getting more information about the appliance and its types, it is necessary for health professionals combined with sports organization to educate and train the physical instructors on in its availability and use and encourage its use widely. The physical instructors have knowledge, especially through media, on the protective efficacy of mouthguards in reducing the orofacial injuries. The results showed that in Sullia, the use of mouthguards is rare in sports, but they are aware of it. It should be a combined duty of pedodontists, sports physicians, and coaches to encourage the use of mouthguards, thus reducing orofacial injuries during training and sports activities. Majority of them could not recommend its use as they were unaware of its availability and the reason for not using the mouth is a lack of awareness programs. Doctors and dentists need to recommend a more intensive education of students in sports medicine and sports dentistry. It was concluded that the use of mouthguards during professional or amateur sports activities should be promoted in Sullia. Which sports are you involved in? Are you aware about the appliance called mouthguard? Have you ever used a mouthguard? How would you feel about playing or training without wearing your mouthguard? Do you believe that mouthguard protect your teeth? Have you ever experienced problems with your mouthguard? If yes, what are those problems? Age of current mouthguard now using? Frequency of mouthguard wear at training? Frequency of mouthguard wear at games? Have you ever seen any oral injuries in athletes during sports activities? Do you believe that mouthguard prevent oral injuries? Do you think that mouthguard influence 'athletics' performance? Is there any sort of education of sports injuries in your club? Would you like to have more information about mouthguard and its type? Ramagoni NK, Singamaneni VK, Rao SR, Karthikeyan J. Sports dentistry: A review. J Int Soc Prev Community Dent 2014;4:S139-46. Mantri SS, Mantri SP, Deogade S, Bhasin AS. Intra-oral mouth-guard in sport related oro-facial injuries: Prevention is better than cure! J Clin Diagn Res 2014;8:299-302. Mohandas U, Chandan GD. Knowledge, attitude and practice in emergency management of dental injury among physical education teachers: A survey in Bangalore urban schools. J Indian Soc Pedod Prev Dent 2009;27:242-8. Ajay J, Ugrappa S. Prevalence of Sports Related Oral Injuries and Use of Mouth-Guards: A Mini Review. Biomed J Sci and Tech Res 2018;6:MS.ID.001283. Matalon V, Brin I, Moskovitz M, Ram D. Compliance of children and youngsters in the use of mouthguards. Dent Traumatol 2008;24:462-7. Yeşil Duymuş Z, Gungor H. Use of mouthguard rates among university athletes during sport activities in Erzurum, Turkey. Dent Traumatol 2009;25:318-22. Academy for Sports Dentistry. Position Statement: Mouth-Guard Mandates; 2010. Available from: http://www.academyforsportsdentistry.org/Organization/PositionStatement/tabid/58/Default.aspx. [Last accessed on 2013 Mar 24].